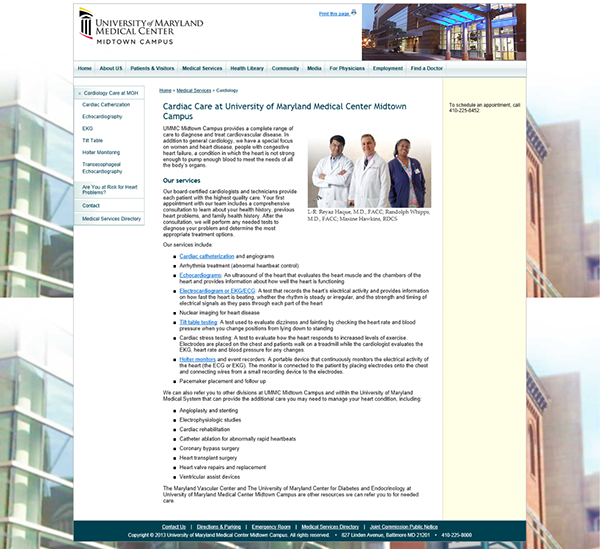 With the Marketing team, managed the redesign of the hospital’s external website to create a more effective communication source. 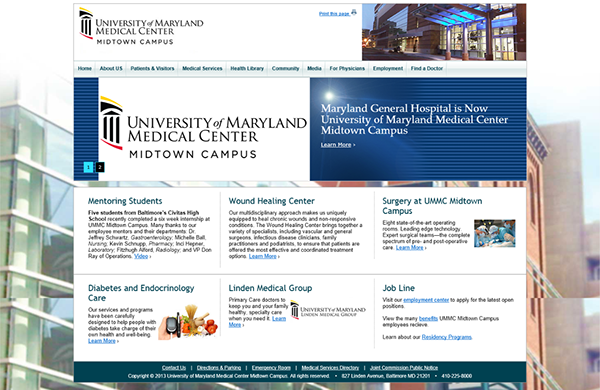 Facilitated content management with hospital departments for site updates and new content needs. 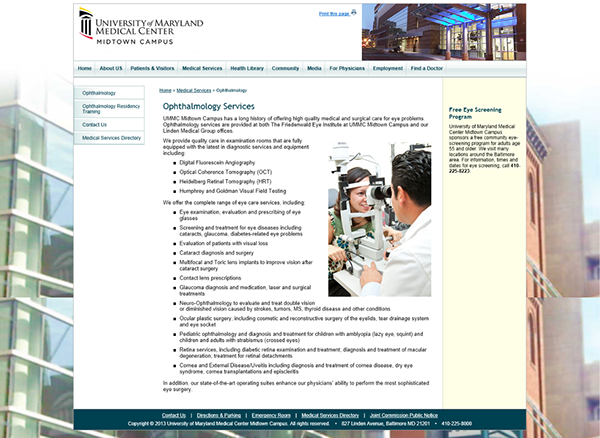 Wrote website redesign proposal containing wire-frame layouts, navigation outlines, project hardware and technical needs, team roles, and base schedule. 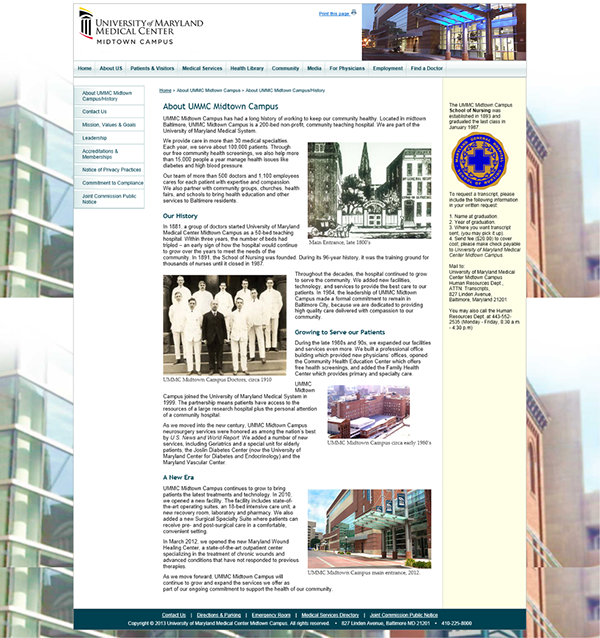 Designed informational and navigational structures, layout, graphics, and coded the new website. • In comparing the six month period before the hospital website's relaunch with the six month period after the relaunch in Google Analytics, these outcomes are found: Although the number of Visits remains the same and the Percentage of New Visitors raises only slightly (1.3%), the Pages Per Visit increases by 12.8%, our visitor's Average Visit Duration increased by a whopping 42.9%, and our Bounce Rate decreased by 21.1%. 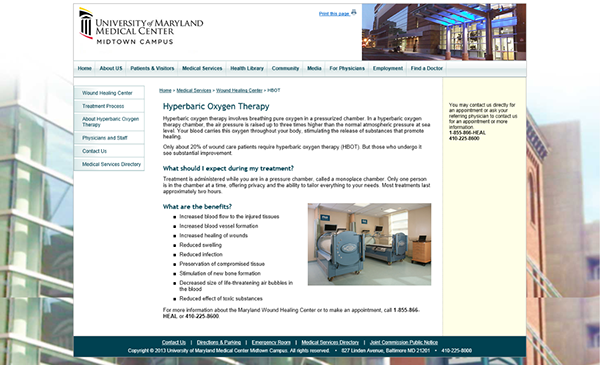 As no new marketing campaign was launched during the second six month period, it can be ascertained that the site's redesign led directly to an increased and more informative use of the site by the primary target audience — hospital patients and visitors. 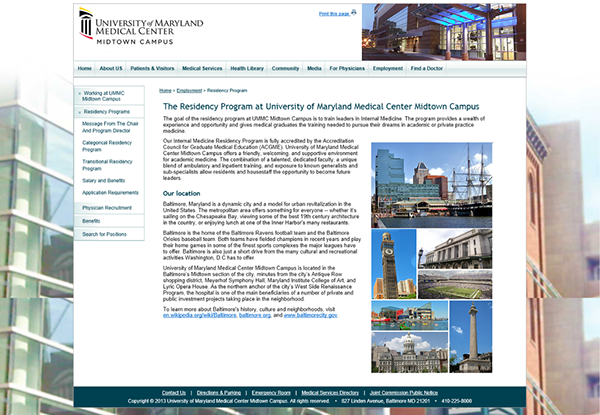 University of Maryland Medical Center Midtown Campus, Baltimore, MD: 10/2010 – 03/2013 http://ummidtown.org Webmaster and E-Communications Coordinator of Maryland General Hospital (now the University of Maryland Medical Center Midtown Campus) With the Marketing team, managed the redesign of the hospital’s external website to create a more effective communication source. 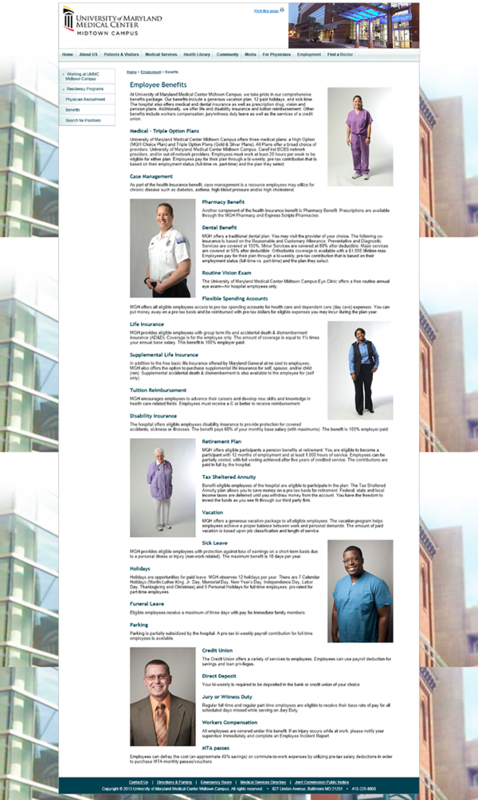 Facilitated content management with hospital departments for site updates and new content needs. Wrote website redesign proposal containing wire-frame layouts, navigation outlines, project hardware and technical needs, team roles, and base schedule. 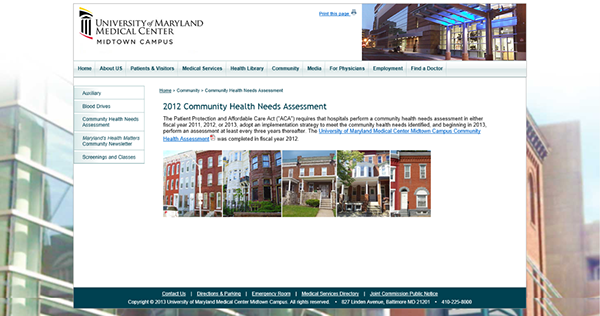 Designed informational and navigational structures, layout, graphics, and coded the new website. • In comparing the six month period before the hospital website's relaunch with the six month period after the relaunch in Google Analytics, these outcomes are found: Although the number of Visits remains the same and the Percentage of New Visitors raises only slightly (1.3%), the Pages Per Visit increases by 12.8%, our visitor's Average Visit Duration increased by a whopping 42.9%, and our Bounce Rate decreased by 21.1%. 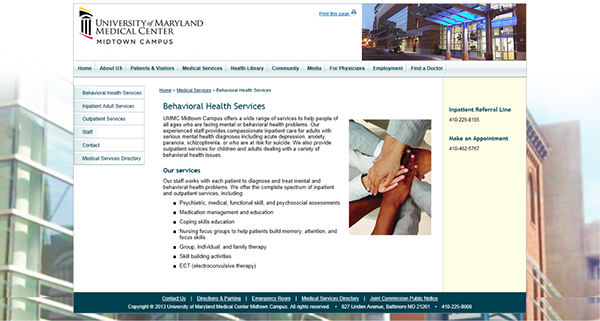 As no new marketing campaign was launched during the second six month period, it can be ascertained that the site's redesign led directly to an increased and more informative use of the site by the primary target audience — hospital patients and visitors.